DETROIT, MI - Corvette Racing will be powered by E85 ethanol, a high-octane, renewable alternative fuel, in the 2008 American Le Mans Series. As part of the series' "green racing" initiative, the most successful team in ALMS history will use a blend of 85 percent ethanol and 15 percent gasoline in the demanding arena of endurance road racing. 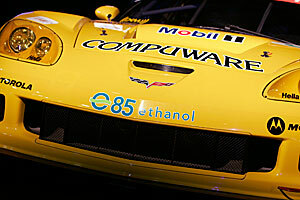 After winning its seventh consecutive GT1 manufacturers and team championships in 2007 using E10 (10 percent ethanol), Corvette Racing's twin Compuware C6.R race cars will make the transition to E85 for the 2008 season. "Since its inception, Corvette has always been a platform for Chevrolet and GM to introduce and develop new technology," Chevrolet general manager Ed Peper said during today's announcement at the North American International Auto Show. "Like the Corvette Z06 E85 concept car that will pace the 2008 Indianapolis 500, the use of E85 ethanol fuel by America's premier production sports car racing team in a high-profile, high-tech racing series like the ALMS shows that Chevy is continuing to lead by example." "By showcasing the capabilities of E85 ethanol before an audience of knowledgeable and technically astute race fans, we can demonstrate the benefits of a renewable fuel that helps to reduce dependence on petroleum, helps to reduce emissions of greenhouse gases, and helps to create greater diversity in energy supplies," Peper said. "Of course, performance is what counts in racing, so E85 ethanol's higher octane rating than gasoline wasn't overlooked by the Corvette Racing engineers." Corvette Racing has formed a technical partnership with the Ethanol Promotion and Information Council (EPIC) to spotlight E85 in the ALMS. EPIC worked with ALMS officials to make E85 the fuel of choice for the series. E85 today is primarily made with grain-based ethanol that reduces carbon dioxide emissions by as much as 29 percent compared with pure gasoline. E85 ethanol already is an option for millions of everyday drivers - andGM leads the automotive industry with more than 2.5 million E85-capable cars, trucks and SUVs on the road in the United States. GM produces about 400,000 E85-capable vehicles a year and will double that to 800,000 a year by 2010. Chevrolet offers seven E85-capable models in 2008. "This is the first time a racing series has made a commitment to E85; the highest performing fuel available to consumers with flex-fuel vehicles," said Reece Nanfito, senior director of marketing for EPIC. "Our partnership with GM and Corvette Racing demonstrates ethanol�s growing relevance in the consumer market." Corvette Racing's transition from E10 to E85 ethanol will be seamless, according to Steve Wesoloski, GM Road Racing Group manager. "The race cars' fuel systems were already 100 percent compatible with ethanol," he said, "so our preparation for the change to E85 in 2008 basically comes down to recalibrating the engines." "GM Racing has had an interest in 'green racing' initiatives worldwide for some time," Wesoloski said. "In 2007, Corvette Racing won the Michelin Energy Endurance Challenge in the GT1 class at the 24 Hours of Le Mans for the most efficient use of fuel during the race. We've participated in discussions with SAE International, the U.S. Environmental Protection Agency, and the U.S. Department of Energy on programs to increase environmental awareness through racing. When it became apparent that the ALMS was going in this direction as well, the decision to use Chevrolet's factory Corvette Racing team to demonstrate both the alternative fuel technology that's available within GM and the capabilities of E85 ethanol was a logical step." Corvette Racing is targeting the season-opening round of the 12-race series, the Mobil 1 Twelve Hours of Sebring, on March 15, 2008, for the debut of its E85-powered race cars.